Wheelchair Lacrosse is one of the newest and most exciting adaptive sports in the U.S. The Colorado Rolling Mammoth, formed in the fall of 2013, is the first wheelchair lacrosse team in the country to be officially linked to a National Lacrosse League professional franchise – the Colorado Mammoth. The Rolling Mammoth has been a leader in the early stages of wheelchair lacrosse’s spread across the United States and its growth internationally. Wheelchair lacrosse now includes eight official teams across the country and continues to expand. 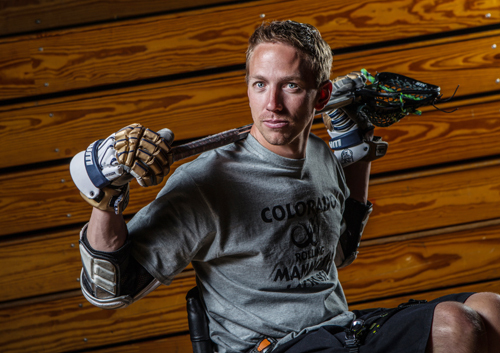 Daniel Hersh, the Rolling Mammoth’s founder and head coach, is a board member of Wheelchair Lacrosse USA and a player on the country’s first men’s national wheelchair lacrosse team. Daniel is also the head coach of the University of Northern Colorado’s men’s (able-bodied) lacrosse team. Who is eligible to play wheelchair lacrosse? Wheelchair lacrosse is open to anyone, whether disabled or able-bodied. The league currently plays without a player classification system, meaning all players are considered equal on the field of play regardless of their level of disability. Can I play wheelchair lacrosse even if I don’t have my own wheelchair? Wheelchair lacrosse players use specially designed sports wheelchairs that are faster and more maneuverable than standard wheelchairs. The Rolling Mammoth has a wide variety of lacrosse wheelchairs for new and prospective players to use when they are first being introduced to the game. Who do I contact if I want to try wheelchair lacrosse? Anyone who is interested in joining a Rolling Mammoth practice as a player or a volunteer can contact Daniel Hersh directly.